4استاد، مرکز تحقیقات علوم دارویی، گروه فارماکودینامی و سم شناسی، دانشکده داروسازی، دانشگاه علوم پزشکی، مشهد. گیاه زعفران با نام علمی (L. Crocus sativus) از خانواده Iridaceae، دارای کاربردهای فراوانی در دنیا و به‌ویژه ایران می‌باشد. علاوه بر کاربرد آن به‌عنوان رنگ و اسانس، زعفران دارای خواص و کاربردهای دارویی و درمانی متعددی می باشد. کلاله زعفران حاوی بیش از 150 ماده شیمیایی بوده که از میان آنها کروسین، پیکروکروسین و سافرانال در ایجاد اثرات فارماکولوژیک زعفران نقش مهمتری دارند. اثرات مفید زعفران و مواد موثره آن دربافتهای مختلف بدن چون سیستم عصبی مرکزی، دستگاه گوارش، کبد، کلیه، قلب و عروق، سیستم خون ساز ، سیستم ایمنی، چشم و سیستم اندوکرین در مطالعات درون تنی و برون تنی مشاهده شده است. خواص درمانی متعددی برای زعفران و مواد موثره آن ذکر شده است که از جمله می توان به اثرات ضد افسردگی، ضد اضطراب وخواب آوری، ضد تشنج، شل کنندگی عضلات، ضد درد و ضد التهاب، آنتی اکسیدان، آنتی آلزایمر، ضد تومور، پایین آورنده قند و چربی خون و ضد سرفه اشاره نمود. مشخص شده است که زعفران دارای اثرات حفاظت کنندگی در سیستم قلبی عروقی می باشد. مطالعات متعدد فارماکولوژیک نشان داده اند که زعفران دارای اثرات ضد آریتمی و ایسکمی قلبی، تعدیل‌کننده فشارخون، آنتی اسکلروتیک و آنتی آپوپتوتیک در بافت قلب و عروق می باشد. در این مقاله مروری به تأثیر زعفران و مواد مؤثره آن بر روی سیستم قلبی عروقی اشاره خواهد شد. Akhoandzadeh, S., Shafiee Sabet, M., Harirchian, M.H., Togha, M., Cheraghmakani, H., Razeghi, S., and Hejazi, S. S. 2010. A 22-week, multicenter, randomized, double-blind controlled trial of (Crocus sativus L.) in the treatment of mild-to-moderate Alzheimer’s disease. Psychopharmacology Journal 207: 637–43. Ayatollahi, H., Ordoei Javan, A., Khajedaluee, M., Shahroodian, M., and Hosseinzadeh, H. 2013. Effect of (Crocus sativus L.) (Saffron) on Coagulation and Anticoagulation Systems in Healthy Volunteers. Phytotherapy Research DOI: 10.1002/ptr.5021. Basheeruddin Asdaq, S.M., and Naseeruddin Inamdar, M. 2009. Potential of (Crocus sativus L.) (Saffron) and its Constituent, Crocin, as Hypolipidemic and Antioxidant in Rats. Applied biochemistry and biotechnology 162(2): 358-72. Bharti, S., Golechha, M., Kumari, S., Siddiqui, K.M., and Arya, D.S. 2011. Akt/GSK-3b/eNOS phosphorylation arbitrates safranal-induced myocardial protection against ischemia–reperfusion injury in rats. European Journal of Nutrition 51(6): 719-27. Boskabady, M.H., Shafei, M.N., Shakiba, A., and Sang Sefidi, H. 2008. Effect of aqueous-ethanol extract from Crocus sativus L. (Saffron) on guinea-pig isolated heart. Phytotherapy Research 22: 330-334. Fatehi, M., Rashidabady, T., and Hassanabad, Z.F. 2003. Effects of Petals Extracts of Saffron on Rat Blood Pressure and on Responses Induced by Electrical Field Stimulation in the Rat Isolated Vas Deferens and Guinea–Pigileum. Journal of Ethnopharmacology 84: 199–203. Fernández, J. 2006. Anticancer properties of saffron, (Crocus sativus L.). Advances in Phytomedicine 2: 313-30. Goyal, S.N., Arora, S., Sharma, A.K., Joshi, S., Ray, R., Bhatia, J., 2010. Preventive effect of crocin of (Crocus sativus L.) on hemodynamic, biochemical, histopathological and ultrastuctural alterations in isoproterenol-induced cardiotoxicity in rats. Phytomedicine 17: 227–32. Grisolia, S. 1974. Hypoxia, saffron and cardiovascular disease. The lancet 2(7871): 41-2. He, S., Qian, Z., and Tang, F. 2004. Effect of crocin on intracellular calcium concentration in cultured bovine aortic smooth muscle cells. Acta Pharmaceutica Sinica 39: 778-81. He, S-Y., Qian, Z-Y., Tang, F-T., Wen, N., Xu, G-L., and Sheng, L. 2005. Effect of crocin on experimental atherosclerosis in quails and its mechanisms. Life Science 77: 907-21. Hosseinzadeh, H., and Ghenaati, J. 2006. Evaluation of the antitussive effect of stigma and petals of saffron (Crocus sativus L.) and its components, safranal and crocin in guinea pigs. Fitoterapia 77: 446-448. Hosseinzadeh, H., and Jahanian, Z. 2010. Effect of (Crocus sativus L.) (saffron) Stigma and its Constituents, Crocin and safranal, on Morphine Withdrawal Syndrome in Mice. Phytotherapy Research 24: 726-30. Hosseinzadeh, H., Karimi, G., and Niapoor, M. 2004. Antidepressant effect of (Crocus sativus L.) Stigma extracts and their constituents, crocin and safranal, in Mice. Journal of Medicinal Plants 3: 48-58. Hosseinzadeh, H., and Khosravan, V. 2002. Anticonvulsant effects of aqueous and ethanolic extracts of (Crocus sativus L.) stigmas in mice. Archives of Iranian medicine 44-7. Hosseinzadeh, H., and Nassiri-Asl, M. 2013. Avicenna’s (Ibn Sina) the Canon of Medicine and Saffron (Crocus sativus L.): A Review. Phytotherapy Research 27:475-83. Hosseinzadeh, H., and Noraei, N. 2009. Anxiolytic and Hypnotic Effect of (Crocus sativus L.) aqueous extract and its constituents, crocin and saftanal, in mice. Phytotherapy Research 26: 768-74. Hosseinzadeh, H., Shamsaie, F., and Mehri, S. 2010. Antioxidant activity of aqueous and ethanolic extracts of Crocus sativus L. stigma and its bioactive constituents crocin and safranal. Pharmacognosy Magazine 5: 419-24. Hosseinzadeh, H., and Younesi, M.H. 2002. Antinociceptive and anti-inflammatory effects of Crocus sativus L. stigma and petal extracts in mice. BMC Pharmacology 2: 7. Hosseinzadeh, H., and Ziaei, T. 2006. Effects of (Crocus sativus L.) stigma extract and its constituentscrocin and safranal, on intact memory and scopolamine-induced learning deficits in rats performing the Morris water maze task. Journal of Medicinal Plants 5: 40-50. Hosseinzadeh, H., Ziaee, T., and Sadeghi, A. 2008. The effect of saffron, (Crocus sativus L.) stigma, extract and its constituents, safranal and croin on sexual behaviors in normal male Rats. Phytomedicine 15: 491-5. Imenshahidi, M., Hosseinzadeh, H., and Javadpour Y. 2010. Hypotensive Effect of Aqueous Saffron Extract (Crocus sativus L.) and its Constituents, Safranal and Crocin, in Normotensive and Hypertensive Rats. Phytotherapy Research 24: 990–4. Imenshahidi, M., Razavi, B.M., Faal, A., Gholampoor, A., Mousavi, S.M., and Hosseinzadeh, H. 2013a. The effect of chronic administration of saffron (Crocus sativus L.) stigma aqueous extract on systolic blood pressure in rats. Jundishapur Journal of Natural Pharmaceutical Products in Press. Imenshahidi, M., Razavi, B.M., Faal, A., Gholampoor, A., Mousavi, S.M., and Hosseinzadeh, H. 2013b. The antihypertensive effect of crocin, an active ingredient of saffron, in chronic administration. Iranian Journal of Basic Medical Sciences in Press. Imenshahidi, M., Razavi, B.M., Faal, A., Gholampoor, A., Mousavi, S.M., and Hosseinzadeh, H. 2013c. The effect of chronic administration of safranal on systolic blood pressure in rats. Iranian Journal of Pharmaceutical Sciences in Press. Jahanbakhsh, Z., Rasoulian, B., Jafari, M., Shekarforoush, S., Esmailidehaj, M., Mohammadi, M., 2012. Protective effect of crocin against reperfusion induced cardiac arrhythmias in anaesthetized rats. Excli Journal 11: 20-29. Javadi, B., Sahebkar, A., and Emami, S.A. 2013. A survey on saffron in major Islamic traditional medicine books. 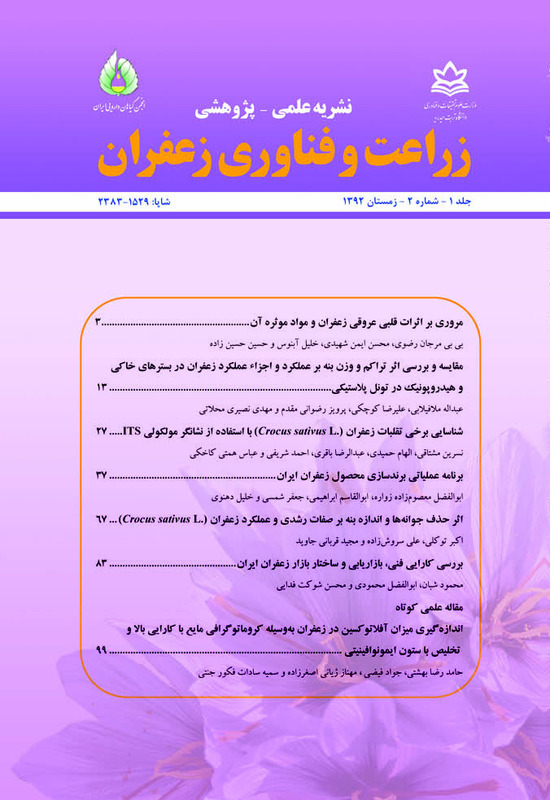 Iranian Journal of Basic Medical Sciences 16(1): 1-11. Kamalipour, M., and Akhondzadeh, S. 2011. Cardiovascular Effects of Saffron: An Evidence-Based Review. Tehran University of Heart Center 6(2): 59-61. Khajuria, D. K., Asad, M., Asdaq, S.M.B., and Kumar, P. 2010. The potency of Crocus sativus L. (Saffron) and its constituent's crocin as an immonomodulator in animals. Latin American Journal of Pharmacy 29: 713-8. Khori, V., Nayebpour, M., Mirabbasi, A., and Rakhshan, A. 2006. The effect of aqueous extract of Crocus sativus on the electrophysiological properties of isolated perfused rabbit AV-Node. Journal of Gorgan University of Medical Sciences 8: 1-3. Liu, N., Yang, Y., Mo, S., Liao, J., and Jin, J. 2005. Calcium antagonistic effects of Chinese crude drugs: Preliminary investigation and evaluation by 45Ca. Applied Radiation and Isotopes 63: 151–5. Meng, L., and Cui, L. 2008. Inhibitory Effects of Crocetin On High Glucose-induced Apoptosis in Cultured Human Umbilical Vein Endothelial Cells and Its Mechanism. Archives of Pharmaceutical Research 31: 357-363. Mousavi, S.Z., and Bathaie, S.Z. 2011. Historical uses of saffron: Identifying potential new avenues for modern Research. Avicenna Journal of Phytomedicine 1: 57-66. Nemati, H., Boskabady, M.H., and Ahmadzadeh vostakolaei, H. 2008. Stimulatory effect of Crocus sativus L. (Saffron) on β2-adrenoreceptors of guinea pig tracheal chains. Phytomedicine 15: 1038-45. Razavi, M., Hosseinzadeh, H., Abnous, K., Motamedshariaty, V., and Imenshahidi, M. 2013a. Crocin restores hypotensive effect of subchronic administration of diazinon in rats. Iranian Journal of basic Medical Sciences 16: 64-72. Razavi, B.M., Hosseinzadeh, H., Movassaghi, A.H., Imenshahidi, M., and Abnous, K.H. 2013b.Protective effect of crocin on diazinon induced cardiotoxicity in rats in subchronic exposure. Chem-Biological Interaction 203: 547-555. Shen, X.C., and Qian, Z.Y. Effects of crocetin on antioxidant enzymatic activities in cardiac hypertrophy induced by norepinephrine in rats. Pharmazie 61(4): 348-52. Sheng, L., Qian, Z., Zheng, S., and Xi, L. 2006. Mechanism of hypolipidemic effect of crocin in rats: crocin inhibits pancreatic lipase. European Journal of Pharmacology 543: 116-22. Soeda, S., Ochiai, T., Shimeno, H., Saito, H., Abe, K., Tanaka, H. 2007. Pharmacological activities of crocin in saffron. Journal of Natural Medicine 61(2): 102-11. Tang, F.T., Qian, Z.Y., Liu, P. Q., Zheng, S. G, He, S.Y., Bao, L. P. 2006. Crocetin improves endothelium-dependent relaxation of thoracic aorta in hypercholesterolemic rabbit by increasing eNOS activity. Biochemistry and Pharmacology 72: 558-65. Xiang, M., Qian, Z-Y., Zhou, C-H., Liu, J., Li, W-N. 2006a. Crocetin inhibits leukocyte adherence to vascular endothelial cells induced by AGEs. Journal of Ethnopharmacology 107: 25–31. Xiang, M., Yang, M., Zhou, C., Liu, J., Li, W., and Qian Z. 2006b. Crocetin prevents AGEs-induced vascular endothelial cell apoptosis. Pharmacology Research 54: 268–274. Xu, G., Qian, Z., Yu, S., Gong, Z., and Shen, X. 2006. Evidence of crocin against endothelial injury induced by hydrogen peroxide in vitro. Journal of Asian Natural Products Research 79: 85-8. Xu, G., Gong, Z., Yu, W., Gao, L., He, S., and Qian, Z. 2007. Increased expression ratio of bcl-2/bax is associated with crocin-mediated apoptosis in bovine aortic endothelial cells. Basic and Clinical Pharmacology and Toxicology 100: 31-35. Yang, R., Tan, X., Thomas, A.M., Shen, J., Qureshi, N., Morrison, D.C., et al. 2006. Crocetin inhibits mRNA expression for tumor necrosis factor-alpha, interleukin-1beta, and inducible nitric oxide synthase in hemorrhagic shock. Journal of Parenteral and Enteral Nutrition 30: 297-301. Zhou, C-H., Qian, Z-Y., Zheng, S-G., Xiang, M. 2006. ERK1/2 pathway is involved in the inhibitory effect of crocetin on angiotensin II-induced vascular smooth muscle cell proliferation. European Journal of Pharmacology 535: 61–68.